Google’s recent move to emphasize results from its own Google+ social networking service is getting some new pushback—in the form of a Don’t Be Evil bookmarklet that reorganizes the site’s search results to place more emphasis on other social networks. 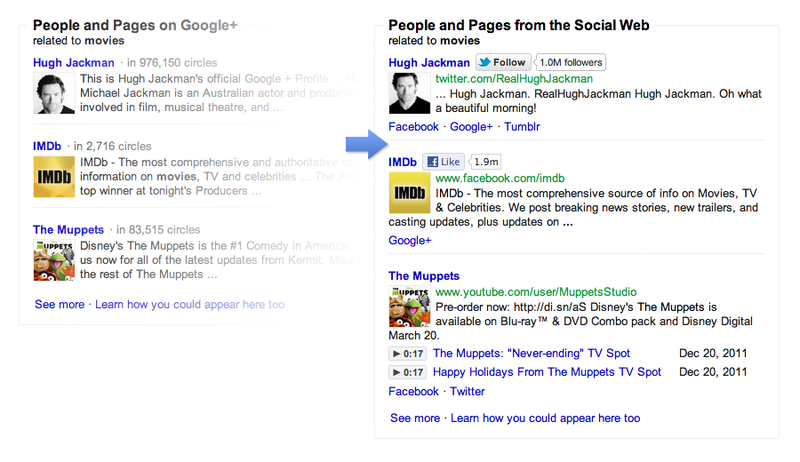 Side-by-side: With the 'Don't Be Evil' bookmarklet, on the right, results from rival social networks appear in Google searches. The service from Focus on the User was designed by a team of anonymous engineers, purportedly including developers from Facebook, Twitter, and MySpace services. But those older services don’t necessarily jump to the top of results if you use the bookmarklet in conjunction with a Google search; instead, Don’t Be Evil offers social results found in and prioritized according to the first 10 pages Google’s own results. So—to use the example that Focus on the User offers in the video below—if you search for AT&T using Google’s current search, the company’s Google+ page appears high in the rankings. Click on the bookmarklet, though, and AT&T’s Twitter page appears instead. That makes sense, the bookmarklet developers say, because the Twitter page has 118,000 followers, while the company’s Google+ page has about about a tenth of that audience. 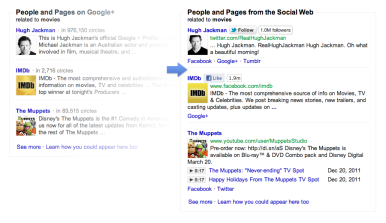 Without the promotion, the Google+ account appears on the sixth page of search results for the company. The bookmarklet can also be applied to suggestions that drop down from a search box while the user is typing in search terms. The bookmarklet’s developers emphasized that they’re not using any APIs or private information to achieve their results—instead, the software essentially “Googles Google” to shift the emphasis from Google’s promotion of its own products in search results. The developers are also making the bookmarklet’s source code available to the public. The Don’t Be Evil bookmarklet—named with apparent irony after Google’s own informal corporate motto—is just the latest pushback against the search giant’s recent efforts to push its social network. The Electronic Privacy Information Center has said it may file a privacy complaint against the company with the Federal Trade Commission.